The election has delivered a savage blow to Malcolm Turnbull and the Coalition government. Turnbull’s attempt to convince voters he could offer jobs and stability has failed. His corporate tax cuts and his attempt to use Brexit and global uncertainty to push up the Coalition vote went nowhere. Now, the Coalition is in turmoil. Their efforts to fearmonger about boats and border security couldn’t save them. The face of their efforts to blame refugees for terrorism and taking jobs, Immigration Minister Peter Dutton, is only hanging on by a thread in his own seat. There are weeks of turmoil ahead as counting is finalised. It seems most likely that Turnbull will have to get support from crossbench MPs to form a minority government. Even if he succeeds, he will struggle to get legislation through parliament and certainly through the Senate. The Liberals couldn’t even keep the infighting off TV on election night, and some are already baying for Turnbull’s blood. Right-wing Liberal Senator Eric Abetz is hinting at moves to overturn the Liberals’ superannuation changes—the centre piece of the Coalition’s budget—in the party room. 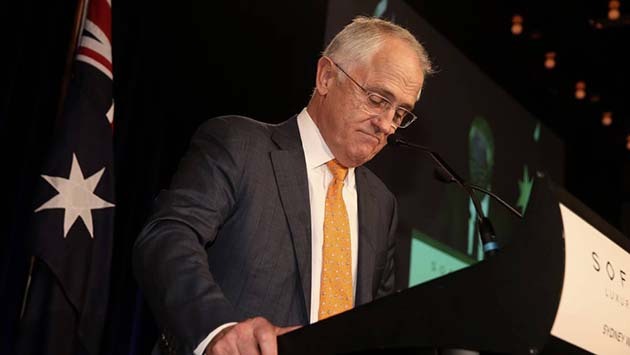 Right-wing commentator Andrew Bolt denounced Turnbull as “a disaster” who has “led the party to humiliation”. Turnbull’s plan for a double dissolution to clear the Senate of annoyances and pass his anti-union ABCC has completely backfired. The Coalition is unlikely to have the numbers to pass the ABCC legislation at a joint sitting. Yet despite the Coalition’s crisis, the disaffection did not all flow to Labor or Greens. Mirroring the turmoil in politics we’ve seen in the Brexit vote in the UK or the rise of Donald Trump in the US, this election registered a big swing to minor parties and independents. This has produced a more right-wing Senate crossbench, with Liberal-lite Nick Xenophon and his team alongside a collection of racists including a revived Pauline Hanson, Jacquie Lambie and shock-jock Derryn Hinch. Bill Shorten claims that “Labor is back”. Certainly, the effort to raise class issues such as the attacks on Medicare helped expose the Coalition as ruling for the rich. But Labor got its second worst primary vote since 1949. A record 23.2 per cent voted for independents or minor parties. Although The Greens did improve their vote slightly, their result was also disappointing. It seems The Greens have narrowly missed winning a second lower house seat in Batman and have lost at least one Senator. While the party has established itself as the home of many left-wing voters, it has been unable to tap into the wider disgust with the political system or the concern about falling living standards. Instead of targeting concerns around Medicare and services, they focused on local issues and climate change, failing to pose the issue as a class question by raising demands like massive public sector investment and job creation. Instead they preferred slogans like “standing up for what matters”. Despite this, The Greens’ increased emphasis on refugee rights was a much needed counter to the fearmongering coming from both major parties, and continues to win the party support from disaffected Labor voters. The danger is that the disaffection with the mainstream parties can be pulled to the right. Turnbull’s anti-refugee racism, the dog-whistling over terrorism and the shootings in Orlando have all encouraged Islamophobia, with Labor failing to oppose it. This has legitimised the rise of Pauline Hanson, who has picked up a Queensland Senate seat. The Australian election result mirrors the political farce in the US with Donald Trump and Hilary Clinton as mainstream Presidential candidates, after the Democrats rejected the massive popular upswell for Bernie Sanders’ campaign against inequality. The Brexit vote also represented a rejection of the neo-liberal status quo. Over the next few weeks, the mainstream political focus will be on parliamentary manoeuvres of one sort or another. A Turnbull minority government will be a weaker government. Yet we can’t just rely on Liberal legislation or the next round of cuts being blocked in the Senate. The next few weeks are crucial for setting the political agenda for the coming period. Refugee rights, equal marriage, saving Medicare, protecting penalty rates and action on climate change will not be determined by what happens in parliament. The fight against racism and austerity will be determined by what happens in the streets and the workplaces. Public servants are still fighting against the Liberal government’s job and wage cuts. The industrial campaign needs to be stepped up. Refugee and equal marriage rallies are already being planned. We need demonstrations to defend Medicare and action on the campuses to stop fee increases or cuts to university spending. We need a serious approach to fighting Islamophobia and standing with the Muslim community. And we need to build socialist organisation to strengthen the fight in every campaign and to fight for a socialist system that produces to meet human need, and not for profit.